Higher Education Spokesperson for the Australian Greens, Senator Lee Rhiannon yesterday tabled a motion in the Federal Senate praising the role of student unions in campus life and calling on Macquarie University to end legal action against seven of its postgraduate students. Whilst the motion, which was debated Wednesday afternoon at 4pm, was unsuccessful, President of the Council of Australian Postgraduate Associations Meghan Hopper said that it drew critical attention to the plight of the postgraduate students who have come to be known as the “Macquarie 7”. “Macquarie University’s legal action against seven of its own student leaders sets a really dangerous precedent in the relationship between student unions and their Universities, so to see Greens Higher Education Spokesperson, Senator Lee Rhiannon acknowledge that and bring national attention to the case through a motion in the Senate is very important” said Ms Hopper. “Since the Macquarie 7 began to receive notice to appear in Court last week, there has been an outpouring of support from around the country from students, academics, trade unions, and from parliamentary spokespeople including Senator Lee Rhiannon, and we feel that has helped the students a lot” Ms Hopper said. “What Macquarie University is putting these student leaders through is wrong, it is obviously deeply distressing to the students involved, and we are very hopeful that Macquarie will withdraw its legal action and reach an outcome which secures genuine, democratic and independent student representation for Macquarie students” Ms Hopper said. Macquarie University is taking seven of its own postgraduate students to the Supreme Court on September 3rd in an attempt to forcibly wind up the seventeen-year-old Macquarie University Postgraduate Student Association and seize over $500,000 in assets accrued through student memberships prior to the introduction of Voluntary Student Unionism. They are also seeking legal costs. The Executive of the Macquarie University Postgraduate Representative Association has not had access to its own bank account since December 20, 2013 when the University sought a freeze on the account through the National Australia Bank. Two of the students involved in the Court case are international students. Over twenty-nine per cent of Macquarie’s students are international students, one of the highest proportions of any Australian University. The Council of Australian Postgraduate Associations has acquired pro bono legal advice for the Macquarie 7 and is also handling all media inquiries on behalf of the students. Calls on Macquarie University to cease its legal action against the Macquarie University Postgraduate Representative Association and its board members, remove any freeze on the Macquarie University Postgraduate Representative Association’s bank accounts and to support independent and democratically run student unions. Student organisations provide important services for students across Australia, including child care, counselling, sports representation and advocacy. The Howard government’s reforms were devastating for students, particularly those from disadvantaged backgrounds who relied on the provision of many of these services. While the student services and amenities fee went some way towards redressing the lack of service provision, its major weakness has always been the fact that independent student organisations have not been guaranteed funding. Macquarie University’s legal attack on ‘the Macquarie seven’—the board of the Macquarie University Postgraduate Representative Association—is unprecedented. As the Council of Australian Postgraduate Associations points out, the issue is an important test case. It is important for those of us who support independent, vibrant, democratic student organisations to stand up against attacks like this, otherwise they may start becoming a common occurrence. Education Minister Christopher Pyne has continued to push ahead with the highly unpopular introduction of fees on PhD and Masters by Research programs for domestic students as part of his Higher Education and Research Reform Bill, tabled in the Lower House today. The President of the Council of Australian Postgraduate Associations, Meghan Hopper, together with the Vice President (Equity), Sadie Heckenberg, today marked the occasion of the tabling of the Higher Education and Research Reform Bill by visiting Christopher Pyne’s Adelaide office, where they submitted a petition of over 2,500 signatures calling on the Minister to reverse his decision to cut the Research Training Scheme by $174.7 million and to allow the introduction of fees on research degrees of up to $3,900 per year. 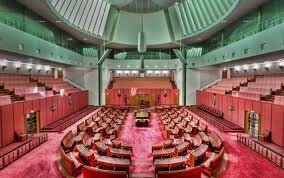 The Council of Australian Postgraduate Associations has received commitments from The Australian Labor Party, The Greens and members of the Palmer United Party that they will not be supporting the introduction of fees on research degrees, and so the policy is not expected to pass the Senate. However, the Minister is in a position to make cuts to the Research Training Scheme without needing to go to the Senate for approval, meaning that PhD and Masters by Research students could find funding to their programs slashed with Universities having no means to make up the shortfall. “It’s time for Minister Pyne to admit that he got this one wrong and go back to the drawing board. His lack of consultation with the sector and with the users of higher education – the students – is evident in these harmful, unpopular, slapdash policies” Ms Hopper said. “He would be better off starting again and actually taking the time to consult with students and educators rather than continuing to flog a dead horse, as the saying goes” Ms Hopper said. “Christopher Pyne was hoping he could get away with sneaking through a dramatic Budget cut to the Research Training Scheme and the introduction of fees on research degrees, but the No Fees on PhDs campaign spearheaded by the Council of Australian Postgraduate Associations has proven that this policy is hugely unpopular, with more than 2,500 students, academics and supporters petitioning the Minister and the Parliament to reverse it” Ms Hopper said. “We delivered that petition to Christopher Pyne’s Adelaide office today shortly after he tabled the Higher Education and Research Reform Bill in Parliament, and we look forward to him reading the comments from students within that petition and to him realising how deeply unpopular this policy is” said Ms Hopper. Ms Hopper said that the introduction of fees on research degrees was equivalent to asking our best and brightest researchers to pay to come to work. “To be accepted into a PhD is an acknowledgement that the student is amongst the very best and brightest in their field, capable of contributing to a unique field of knowledge. The Research Training Scheme, which currently allows Universities to offer PhD studies free to domestic students, has always been an acknowledgement of that fact” said Ms Hopper. “The cuts to the Research Training Scheme and the introduction of fees on research degrees are an attack on our future research leaders and our future academic workforce and we are looking forward to seeing the Senate reject these policies in the strongest possible terms” Ms Hopper said. “Postgraduate students are also strongly opposed to the increase in interest rates on HELP debts of up to 6 per cent, which will have a particularly adverse impact on those who choose to price themselves out of repayments whilst undertaking further study” said Ms Hopper. The Council of Australian Postgraduate Associations has called on Education Minister Christopher Pyne to explain why student leaders are being removed from Government-linked committees, after a letter sent to him more than five weeks ago has remained unanswered. The Presidents of the peak bodies representing Australia’s student population, the Council of Australian Postgraduate Associations and the National Union of Students, have not been invited back to two Government committees they sat on prior to the election of the Abbott Government – and Minister Pyne has yet to explain why. “The Presidents of both the Council of Australian Postgraduate Associations and the National Union of Students have sat on the Office for Learning and Teaching’s Awards Standing Committee since its inception, but this year neither organisation has been invited back” Ms Hopper said. “When I sought further information as to why we had not been invited to be part of the OLT Awards Standing Committee in 2014, I was advised that ‘All the positions in all the committees in 2014 are up for review and decision by the Government’” Ms Hopper said. “That was back in June and nominations for the Awards closed in May, so it certainly looks like this Government has no place for student leaders on the panel that determines awards for excellence in teaching and learning” said Ms Hopper. Ms Hopper said that she and the President of the National Union of Students had also previously sat on the National Advisory Group on Higher Education Data and Information (NAGHEDI), but had not been invited to participate in the reference group that replaced it. “We received advice from the Department on July 11th that following the establishment of the TEQSA Advisory Council, it had been decided that the NAGHEDI would be replaced by a Higher Education Data Committee. The letter thanked me for my service on the NAGHEDI but said nothing about how postgraduate students would be represented on the new Committee” Ms Hopper said. “I wrote to Minister Pyne on July 16th seeking a response around why his Department appeared to be eroding consultation with student leaders on their Committees and five weeks’ later, I am yet to hear from him” said Ms Hopper. “This is part of a larger concern that the Council of Australian Postgraduate Associations has with Christopher Pyne refusing to consult with students on any of the plans his new Government has for higher education” Ms Hopper said. “Then, after months of ignoring student leaders, on Sunday he insults us and tells us to ‘get some perspective’. He keeps arguing that students shouldn’t be protesting the higher education Budget cuts but then he won’t give us any other method of communicating with him” said Ms Hopper. Seven Macquarie University postgraduate students elected to represent their peers have in the last few days been served with instructions to appear at the Supreme Court of New South Wales on September 3, 2014 to defend themselves against the University where they are currently studying, the Council of Australian Postgraduate Associations has revealed. Macquarie University is asking the Supreme Court to forcibly wind up Macquarie University Postgraduate Representative Association (MUPRA), to appoint a liquidator, to distribute the net assets of MUPRA – which sit at approximately $500,000 – to Macquarie University, and that Macquarie University be awarded costs. Because MUPRA is not an incorporated association, the elected members of its current Executive are listed as individual defendants to Macquarie University’s application. “We are gravely concerned about the potential implications that this case will have not just for our friends at Macquarie University Postgraduate Representative Association, but for independent student unions at campuses across Australia and indeed, the concept of independent unionism itself” said Meghan Hopper, President of the Council of Australian Postgraduate Associations. “This craven and cynical attack on seven of Macquarie University’s own students, students who put their hands up to represent their peers and who are now being punished for that act, can not be tolerated and must be fought vigorously by all those who value unionism and student advocacy” Ms Hopper said. Macquarie University has established an ‘Advisory Board’ which they are arguing should replace MUPRA. The Chair of the Advisory Board is appointed by the University Chancellor and is not directly elected. “If a Court accepts that it is appropriate for a University to simply replace a union with an ‘advisory body’ Chaired by a person hand-picked by the University and directly responsible to the Chancellor, that will be a tragic step in the history of student unionism in Australia and will send a very dangerous message about independent representation and advocacy” Ms Hopper said. “Student unions at their core exist to provide independent representation for students to the Universities that they pay fees to. To claim that a University can represent students against the University is just a furphy and it’s an obvious violation of the very notion of unionism” Ms Hopper said. Ms Hopper said that it was particularly alarming that the University was seeking costs. “The Council of Australian Postgraduate Associations is committed to assisting the seven students involved in whatever way we can – we are currently speaking to lawyers to ensure that this case is vigorously defended and once we have a sense of the potential costs to the individuals involved, we will be arranging fundraisers to assist with those” Ms Hopper said. Ms Hopper said that the case was a blatant grab at money that MUPRA had wisely saved and invested over many years to protect themselves against Voluntary Student Unionism and diminished support from their University. On December 20 2013, the National Australia Bank placed a freeze on MUPRA’s bank account in response to a request from Macquarie University, meaning that MUPRA has been without access to funds to operate or adequately defend itself against legal action since that time. “If I hadn’t seen it with my own eyes I could not believe that any University could provide funds to a student association without a service level agreement and then, several years later, say ‘actually, we’re not satisfied with the fact that you saved some of that money to protect against diminished funding in later years, we’re going to order you to give it all back now’” Ms Hopper said. “Of the $500,000 that Macquarie University Postgraduate Representative Association currently has held in a bank account that they can no longer access, some of that money was earned through frugal investment in high interest bank accounts and through the offering of events and services” said Ms Hopper. “Macquarie is not even proposing to redistribute MUPRA’s funds toward student advocacy and representation, but will instead use it for postgraduate scholarships” Ms Hopper said. Palmer United Party Senator Jacqui Lambie has today pledged her support for the Council of Australian Postgraduate Associations’ campaign to stop cuts to the Research Training Scheme and fees on PhDs, in a move that all but guarantees that the Budget measure will not pass the Senate. In her first meeting with an Australian student peak body, Senator Lambie sat down with CAPA President Meghan Hopper in Canberra today to reaffirm her party’s commitment against university fees and in favour of improved student consultation. 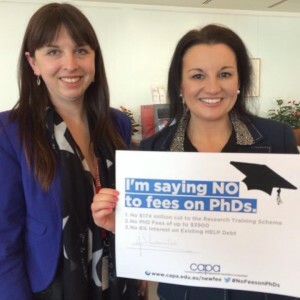 “We are thrilled to receive Senator Jacqui Lambie’s strong support for our No Fees on PhDs campaign today and know that with the support of the crossbench, we will be able to stop Christopher Pyne’s proposed cuts to the Research Training Scheme” said President of the Council of Australian Postgraduate Associations, Meghan Hopper. “These cuts of $174m to the Research Training Scheme, which add up to 10 per cent of the pool of funding for domestic students to undertake PhDs and Masters by Research, would have a terrible impact on Australia’s research economy and would place a roadblock in the way of Australia’s future research leaders” Ms Hopper said. “As a result of these dramatic cuts, Universities would be given no choice but to charge fees on PhDs and Masters by Research of up to $3900 a year – a move that Palmer United Party Senator Jacqui Lambie has indicated she will oppose, in line with her Party’s opposition to university fees” Ms Hopper said. “Our No Fees on PhDs campaign has already had the support of Labor Party and Greens Senators, who have pledged to vote against the Research Training Scheme cuts on our website www.capa.edu.au/newfee; but now to have the confirmed support of an influential cross-bench Senator is exactly the outcome we needed to stop this terrible Budget policy” said Ms Hopper. Senator Lambie recently joined the National Tertiary Education Union’s campaign against deregulation but had not previously made any statements specific to the Research Training Scheme or fees on PhDs. Ms Hopper also discussed proposed changes to the Student Services and Amenities Fee with Senator Lambie and shared some of the outcomes of CAPA’s soon-to-be-released Save Our SSAF survey of over 500 postgraduate and research students from across Australia. “Senator Lambie indicated very strongly that she believes more consultation needs to be undertaken with the end user of higher education – the student – and that she welcomes the contribution of bodies like the Council of Australian Postgraduate Associations to the discussion around changes to the higher education sector” Ms Hopper said.